Get ready, party animals! 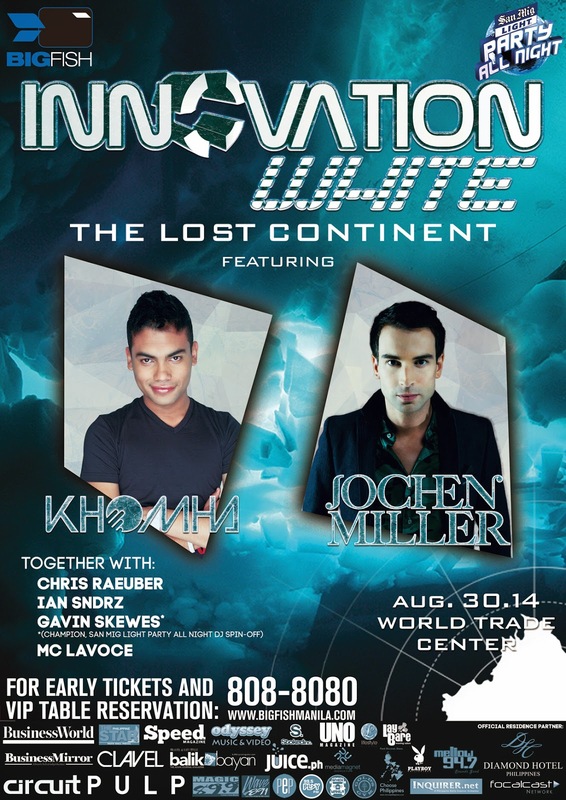 BigFish Production brings to Manila international DJs Jochen Miller and Khomha for a night of magical dance event, finding and exploring "The Lost Continent" at World Trade Center in Pasay City this coming weekend, August 30, 2014. Inviting everyone to wear WHITE on this amazing night of partying, Innovation White The Lost Continent will also feature BigFish's residents DJs like Ian Sandrz and Chris Raueber. To reserve VIP tables, kindly contact them at (02) 8088080 / 09178847333. VIP Tables for Stage 1 cost Php30,000.00, VIP Tables for Stage 2 cost Php25,000.00, and VIP Tables for Stages 3 and 4 cost Php20,000.00. All VIP tables come with 1 Premium bottle of Absolut vodka, 10 SML beer and a mixer. As for those who prefer Cocktail tables, each table costs Php7,000.00, which is good for 5 pax, and comes with 20 bottles of beer. For individuals who wish to party, VIP tickets are being sold for Php3,500.00, which comes with 2 drinks. The pre-selling of tickets for regular party-goers, each ticket costs Php700.00, while the door charge will be Php1,200.00. For more information, kindly visit www.bigfishmanila.com! Work Hard Party Harder! See you all there!